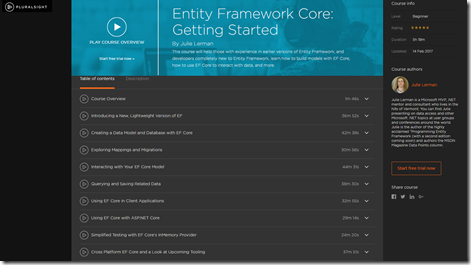 I’m happy to share a new course on Pluralsight with you – Entity Framework Core: Getting Started. Most software – whether for business or entertainment – is driven by data that users need to interact with. In Entity Framework Core: Getting Started, you will learn how to use Microsoft’s modern data access platform, Entity Framework Core. You will learn how to build data models, use EF Core to bridge your software with your data store and how to incorporate all of this into desktop, mobile and web applications. When you’re finished with this course, you will have a foundational knowledge of Entity Framework Core that will help you as you move forward to build software in .NET, whether you are targeting Windows, OS X or Linux. Software required: Visual Studio 2015 or Visual Studio 2017. Here is the list of modules in the course. You can see the titles of various clips in each module on Pluralsight. I had written these details for my Pluralsight EF Core course (hopefully published at end of Jan 2017) but decided not to spend the time on this explanation in the course. Instead, I’ll put it here and the course will have a link to this blog post! Clever, huh? You’ve probably heard a lot about EF Core not bringing forward the designer based EDMX from EF Core. This is a feature cut that I’ve heard the most feedback about. But there are other EF features that are also getting cut. These are not as worrisome to developers — based on my own experience and paying attention to response in social media — but it’s important to be aware of the biggest of these cut features. The first is the ObjectContext API. This was the original mechanism for EF’s change tracking and database interaction. Since EF4.1 was released with the DbContext in early 2011, Microsoft has recommended that all new projects use DbContext. The DbContext sits on top of the ObjectContext and does the more cumbersome work of interacting with the ObjectContext on your behalf. But the ObjectContext has remained a public API for backwards compatibility with EF4 and EF3.5 projects. Also, we could access the ObjectContext to do low level tasks as needed. There will not be an ObjectContext API in EF Core. Rather than relying on the ObjectContext for metadata work, change tracking and database interaction, this low-level activity is being restructured and we’ll get at it directly from the DbContext. If you have old software that is still using the ObjectContext and you haven’t updated it by now, hopefully, you won’t want to update it to EFCore anyway. I wrote a 2 part article for MSDN magazine in 2014 that included guidance for moving ObjectContext code to DbContext if you think you may want to explore that. Entity SQL was the original string-based querying SQL like language written for EF. By the time EF was first released, it had already embraced the also-new LINQ. ESQL is only usable with the ObjectContext API. I think I used to be one of the few people in the world who really knew how to use ESQL because I wrote about it extensively in my first EF book, giving it equal visibility as LINQ to Entities. In the 2nd edition, I had split the ESQL details out into their own chapter because by then it was clear that it was barely being used. I haven’t had any reason to use ESQL in many years. I’ve not heard of anyone using it either. So it is going to fade away along with the ObjectContext API and won’t be part of EFCore. Entity Framework has allowed a lot of variations on mappings between your classes/properties and your database tables/fields. It has even let you combine many of these crazy mappings in one model. The EF team blog post highlights and example: “an inheritance hierarchy that combined TPH, TPT, and TPC mappings as well as Entity Splitting all in the same hierarchy.” This was possible because of the Metadata Workspace API. But building in this flexibility also meant that using that API was very complex. Internal query compilation was difficult to design. And for developers, discovering information about a model’s metadata has been very cumbersome. So, EFCore has a simpler metadata model which means some of the truly edge case mappings won’t be achievable. This doesn’t mean things like inheritance will go away (although currently, EF Core only supports TPH), just the funky, rare mapping combinations. One single mapping technique that will go away is MEST. In all of my years of working with EF, I’ve never come across anyone who was taking advantage of it. It was only supported with EDMX and ObjectContext and the team decided not to bring it forward to the code-based model and DbContext for EFCore. Migrations are a critical technique for evolving a database schema from a code-based model. We’ve had two ways to use EF migrations – the default way which is to explicitly add migrations through the package manager console and then to apply those migrations using a variety of techniques. Another option has been to use automatic migrations that are worked out and executed on the fly at run time. Supporting automatic migrations caused a number of major headaches for migrations support overall. It forced migrations to store model snapshots directly in the database. This caused problems for developers using regular migrations – especially with source control. I’ve been in loops where I can’t add a migration because it thinks I need to execute one, but when I try to execute a migration it tells me I have to add one. I’m not the only one who has gotten all tangled up in some circular problems when trying to manage migrations. These problems will go away because EFCore will not attempt to automate migrations at all. You can read more about this in Brice Lambson’s blog post about EFCore Migrations at design time. Brice is an engineer on the EF team and has a lot of other interesting blog posts worth checking out. These are the most notable EF features that the team is not planning to implement at all in EFCore. Personally, I have not been using any of them ever or in a long time and I have guided my clients away from them as well. So if you are on that same path, you are well-positioned to use EF Core without having to worry about them.